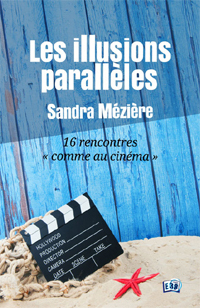 Sandra Mézière is the author of two books evoking her passion for cinema, Deauville and the American Film Festival: her first novel titled L’amor dans l’âme and her collection of short stories about the Cinema Festival titled Les illusions parallèles (Editions du 38). On May 24th, 2014, in Cannes, on the penultimate day of the 67th Film Festival, a young actress is found dead in the room of a luxury hotel, shot in the heart. The evident proofs do not leave any doubts about the circumstances of the tragedy. What happened in her life to make her life end in these tragic circumstances? May the key of this drama be found among the people who have known her in the previous four years or in her past, whose stories mix throughout her childhood and cinema festivals? L’amor dans l’âme is a melancholic novel, magnificently roman, a story combining impossible mourning and love, and casts a questioning light on human comedies. L’amor dans l’âme is also a declaration of love to the great passion of Sandra Mézière, that is to say cinema, and to the festivals she has been covering for several years and that she perfectly knows, such as the American Film Festival of Deauville, the Cabourg Festival and the Cannes Festival in which the character of this first novel evolve. 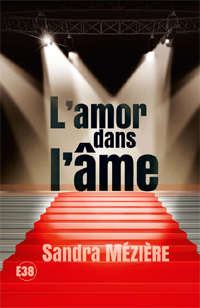 The novel titled L’amor dans l’âme on the official website of publishing house Les Editions du 38.
Who has never dreamt that his life could look like a film? Or that his/her illusion could turn into reality? Where the border between cinema and reality is particularly impervious, where destinies brush past each other as parallel shadows, you can find 16 stories of encounters in the fascinating and unique universe of Cinema Festivals of Deauville, Cannes, Monaco, Dinard, Paris, Cabourg, La Baule, Annonay, Lyon, Saint-Jean-de-Luz, Beaune and even the "César" award ceremony. The characters walking between these pages, gladly passing from a side to the other of the big screen, shout accuracy if not humanity for some people, and despite all opposition turn their dreams into missed love, secret disillusion or frustrations that may profoundly change the future. Extraordinary and roman passionate texts are characterized by a delicate and wounding writing, in which Mézière cruelly take off the masks and reveals with no concession the other side of the scenery. She shares her devouring passion for cinema and the festivals she has been covering for a long time and many more secrets revealed by these short stories to travel, shiver, dream, vibrate…as if you were at the cinema! The collection of short stories titled Les illusions parallèles on the official site of publishing house Les Editions du 38.